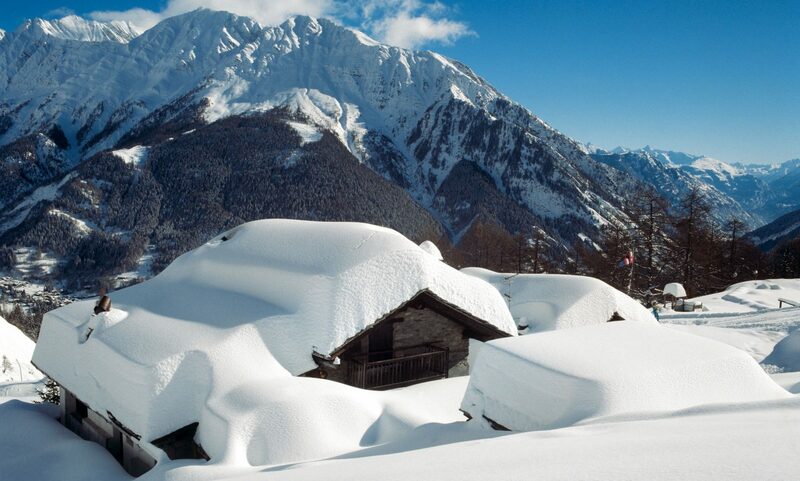 Courmayeur is considered a snow sure resort. The ski season has started on Saturday 25th November and snow has fallen in November and December, auguring a White Christmas. Skyway has two rotating funiculars but this is not part of the lifts of Courmayeur – in the weekly lift ticket, you have two days to ski in another resort of Aosta Valley OR to take up the Skyway lift – people take the Skyway lift that is composed of two rotating funiculars up the mountain to see the views of the Mont Blanc and Dent de Geant, and those good skiers hire mountain guides to come down the freeride area back to Courmayeur or go down the Valle Blanche to Chamonix. Skyway receives 3,000 + visitors per day, it has 350 car slots available, and the cable-car rotates 360 degrees along the way, 10 minutes to reach the summit. This reaches 3,466 meters to Punta Helbronner. At the middle station there is a wine testing area from Cave du Mont Blanc (2,173 meters), and from top, there are spectacular 360 platform viewpoint of Monte Blanc. There is also a cinema and conference room with 120 seats. Punta Helbronner has a gondola ride connection that goes on top of the Mar de Glace towards Aiguille du Midi. There are 2 restaurants at Skyway with 150 seats and 3 bars. Photo by Gughi Fassino – Centro Servizi Courmayeur. The Amazing Ski Area of Courmayeur. Rental shop –4810 – with a shop in downtown Courmayeur and another on Plan Chécrouit. There are 106 km of pistes, but of these, realistically 41 KM are groomed slopes and 65 km is off-piste. So resort-wise, it is small, with magnificent views. If you are an intermediate that does not want to go off piste- and you want to ski lots of km of pistes, like in Courchevel, you should tell the client – this is great for those of us that do not mind repeating some pistes and having some time in the lovely mountain huts/restaurants. A ski instructor helps a kid on its first snow steps – Photo Gughi Fassino – Courtesy Centro Servizi Courmayeur. The Amazing Ski Area of Courmayeur. Snowpark at 2,000 meters with a progressive zone with rails which are easy to tackle, perfect for beginners, and a more difficult one for advanced riders with a set of 6 to 8 meters high jumps and various structures for jibbing. The pride of the new snowpark is the Big Air Bag with a size of 15x 15 meters. It is the biggest Air Bag in the Aosta Valley and it is also the largest in Europe. All have great views towards the Mont Blanc and the Mont Blanc chain. People walk to either the Armani tram if staying in town, or are whisked to the Dolonne cablecar or Val Venny tram and go up the mountain. Plan Checrouit is where both the Armani tram and Dolonne Cablecar arrive at, and there people leave their skis, snowboards and boots on lockers on the mountain, so you can walk everywhere in town without having to carry your ski/snowboard equipment. The Armani tram stays opened until late, so people can stay in Plan Checrouit in the different restaurants and bars having aperitivo or dining on the mountain seeing the sun setting down, which is very popular. The Armani Funivia takes passengers to Plan Chécrouit from downtown Courmayeur- Photo: Gughi Fassino-Centro Servizi Courmayeur. The Amazing Ski Area of Courmayeur. Facing the north-east of the mountain it is the above the treeline plateau. You can reach there through the cable car leaving from the centre of Courmayeur (the Armani funicular) or from the new gondola leaving from Dolonne. The most loved runs is the Chécrouit red piste, where the first Ski World Cup in the Aosta Valley was held. It can be reach by the cable car from Entrèves and faces the north-west. Here you will find long pistes winding through the woods with exciting off-piste alternatives. In the winter snow is guaranteed. Pistes are always perfectly prepared with the exception of the “piste dell’Orso” which is purposely left un-groomed, for those looking to ski bumps and a more difficult descent. Another piste that stands out is the “Internazionale”, a vast panoramic slope down the side of Val Vény. Courmayeur is known as the capital of freeriding. Funivie Mont Blanc take riders from La Palud up to Rifugio Torino to the “Top of Europe”, the off-piste paradise which gives access to the Chécrouit, Vesse, Arp Vielle, Cresta di Youla and Dolonne gullies. There is a training facility for freeriders conducted by Fondazione Montagna Sicura whose headquarters are in Courmayeur. Two new “Search Training Systems” have been installed in the vicinity of Pavillon, the Funivia Mont Blanc arrival station, and in the area of Pré de Pascal in Val Vény, and the Courmayeur Mont Blanc Funivie ski area. The Alpine Guide Society are regularly involved in promoting self-aid courses and also training on how to use the most classic instruments for mountain rescue, which are important for people to have fun in safety. Children can learn safe off-piste skiing at school. The two schools in Courmayeur organise freeriding courses for children and teenagers. In order to teach how to ski on all kinds of terrain and under all conditions, the Mont Blanc Ski School offers an annual freeriding course for more expert skiers age 10 to 16. The Courmayeur Scuola di Sci e Snowboard organise courses for children starting from age 6 and a Freeride Camp also for snowboarders. Check our last part of our family ski trip last year in Courmayeur.